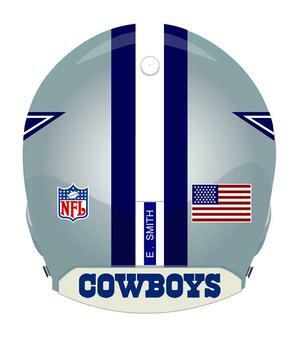 The Dallas Cowboys are a professional American Football team from the Dallas, Texas, USA area. Their stadium, AT&T Stadium, is in Arlington, Texas, which is just outside of Dallas County, Texas. Before 1970 they played at the Cotton Bowl Stadium before 1971. From 1970 to 2008 they played at Texas Stadium in Irving, Texas, which is just outside of Dallas. They were started when they joined the NFL in 1960. They have won 5 Super Bowls, and they are currently owned by Jerry Jones. Their uniform is white silver and blue with a blue star on their helmet. Troy Aikman was a great quarterback for the Cowboys. Emmitt Smith and Tony Dorsett were notable runningbacks. 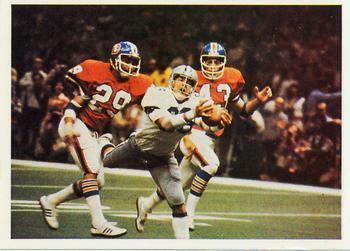 The Cowboys are often known as "America's Team." 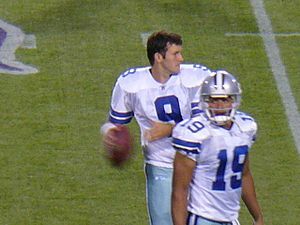 The team's current starting quarterback is Tony Romo and their head coach is Jason Garrett. Dallas Cowboys Facts for Kids. Kiddle Encyclopedia.